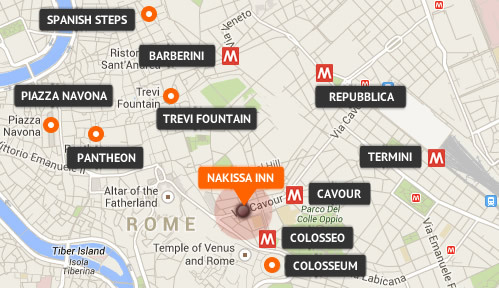 The Nakissa Inn Rome is a great value for money guest house in the centre of ancient Rome just 5 mins walk from the Coliseum and the Imperial Roman Forum. Take a look at our Photo Gallery page for a more visual representation of our great facilities, and when completely satisfied, make use of our secure online booking system to enjoy the lowest possible prices. 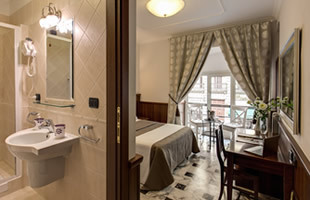 The guest house itself offers a private terrace with tables and chairs in which to relax and enjoy the typical Roman atmosphere in addition to many other features and services. 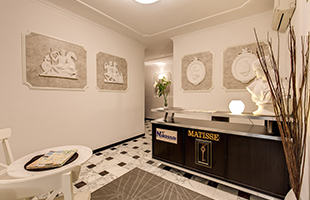 Our multi lingual staff are committed to providing guests with a high level of personal service that gives the impression of staying in a hotel but with the more affordable prices of a bed and breakfast. 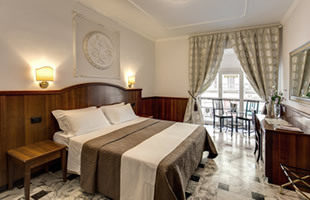 Situated in one of the trendiest areas of Rome – Monti – with quality restaurants, chic boutiques, charming cobbled streets and a host of cafes and bars, guests are also within walking distance of the golden papal Basilica of Santa Maria Maggiore.